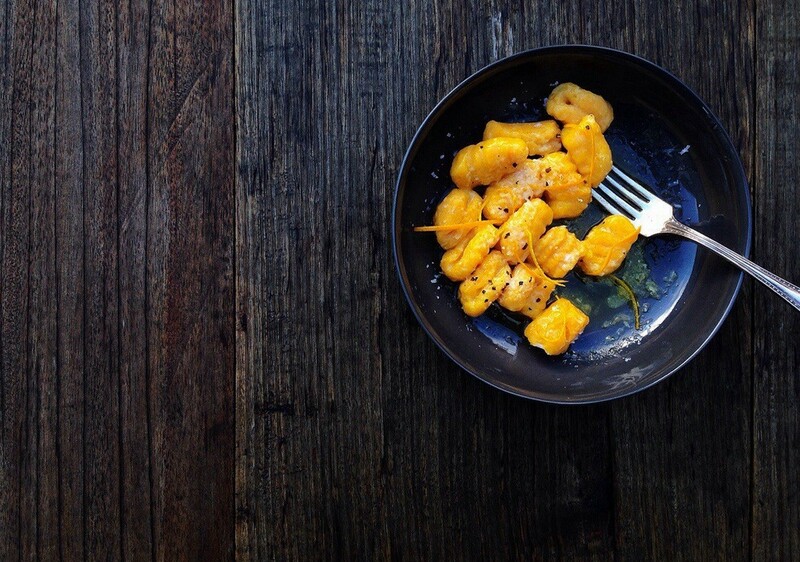 Pumpkin gnocchi - make your day brighter! Gnocchi - Italian dishes, depending on the product is something between our lazy dumplings and dumplings. Most often they are boiled or baked (sometimes a little decoction, fried). Gnocchi can be prepared from different types of flour, potatoes, semolina, or using ricotta cheese (or may not) in different regions of Italy gnocchi prepared differently, variations in recipes and - tens! Combining these ingredients in different proportions, the result will amaze you every time a new taste. Also very popular and gnocchi dough with the addition of vegetable puree, green: pumpkin, eggplant, beet, spinach, basil and so forth. 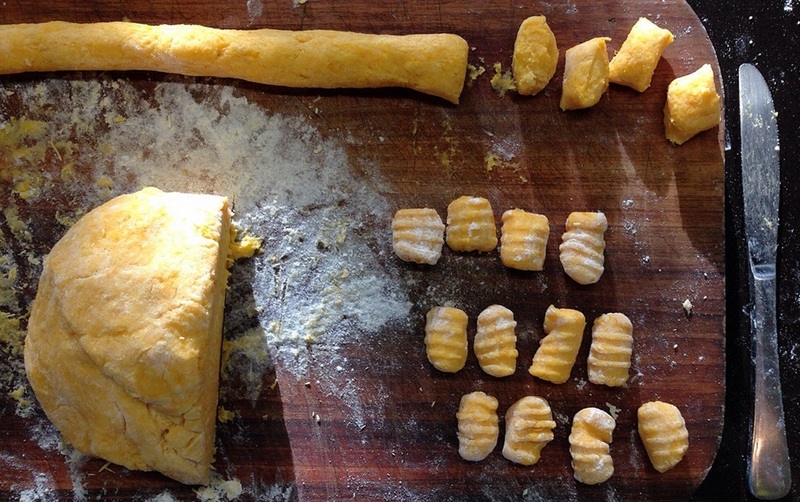 One of my favorite choices - pumpkin gnocchi from cheese and chick-pea flour. Those lazy dumplings, only with a spicy aroma of pumpkin and use of chick-pea flour. As for me - perfect for breakfast. In general, the gnocchi - a song! And I love these dishes for what they can to stick and freeze for future use. Then just boil the water, get out of the freezer gnocchi and boil a few minutes - and proper tasty breakfast is ready! *To prepare the pumpkin puree, it must be pre-baked (in the oven or in a microwave oven 5-7 minutes), boil. **If desired, you can replace the chick-pea flour (or part thereof) for wheat or oatmeal. Eggs are a little beat. Add to them cheese, stir until smooth, and then - pumpkin puree. Again mix. Then add the flour (in several stages, may require a little more or less - depending on the test, it ultimately does not stick to your hands), semolina, grated parmesan, salt and nutmeg. Knead the dough - it must be cool and not stick. Roll out the dough, divide it into several parts (I - 4). From every part of the roll arms long "sausage", you can just flatten it with a knife. Cut it into equal parts (1,5 cm wide). The resulting gnocchi set aside slightly floured. Do the same with the rest of the test. To boil, to throw gnocchi in boiling water literally 2-3 minutes. Surfaced - so ready! Serve they can with what your heart desires: sprinkle your favorite spices and herbs, again with grated parmesan cheese. Amazing blend of gnocchi with gorgonzola (or other soft cheese with blue mold). Sour cream or yogurt - is generally constant A classic :) pesto or tomato sauce will add spice. Also, if you are not afraid of excess fat, a piece of butter perfectly complement the taste of the dish. Enjoy your meal and not be afraid to experiment!